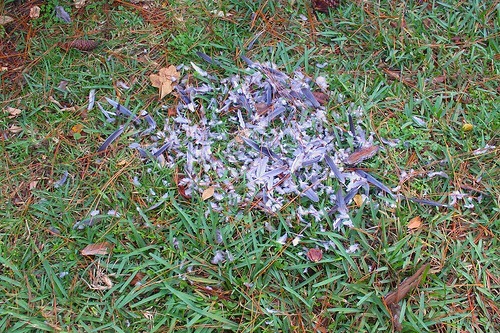 And all that remains is a pile of feathers. 5 weeks ago our beloved heritage turkey hens left home to sit on the nests they had secreted in the pastures and bushes around the property. We wanted to experiment and see if our hens could follow their instincts to hatch, sit, brood, and raise their chicks themselves without our having to coop them up and deprive them of their normal and natural foraging and freedom. That choice, however, did not turn out well. From time to time over the last few weeks we would spot a hen turkey here or there as they left the nest occasionally to get water or food. I began to worry when, over the last few days, we didn’t spot any of our hens at all nor did they return with their broods. So yesterday the Sunday Search and Rescue Party (me and Scooter) walked every inch of the areas that the turkeys access to try to determine the status of our hens. To condense several hours of bushwhacking into one sentence, we found destroyed nests and a couple sad piles of feathers that confirmed the deaths of half of our hens. It looks like a bobcat got one hen and the other was possibly a coyote. We don’t hold out much hope for the others since we didn’t hear any hens or poults returning our calls or coming to investigate. Our hens are very friendly and usually come running when we call them or get into their field of vision. So it was another rough day on the ranch. We definitely need some fences to help deter the predator population around here. The nests that I’ve found yesterday as well as earlier nests the hens had made contained from 12 eggs up to 38 eggs per nest. If the hens had successfully raised half of the eggs laid into healthy marketable poults, then we had a real chance of having our first profitable enterprise here on the ranch. The loss of these hens not only is sad on its own merit, but is a financial loss as well. We had invested $50 of food, water, and electricity (for brooding them as poults) into each hen. So the ranch suffers a $200 loss on the hens, plus the cost to procure and raise replacements (another $200) on the turkey operation. If half of the over 100 eggs in the nest had returned to us as poults, we could have sold them for $10 each immediately. That’s $500 guaranteed, because we actually had 6 people on a waiting list for poults. We also could have raised them as Thanksgiving turkeys we sell for $75 each – at a profit of $20 per bird gives us $1000. So with a successful nesting season we had a real chance of going “right side up” on our turkeys this year. As is, even though we have poults we are raising for Thanksgiving, we won’t have enough to create a positive margin yet this year. It will take at least one more year on the turkeys. That’s the financial bottom line. The emotional bottom line is that it’s very hard to take care of something every day for 352 days, have them follow you around as you work, and have them swing in your porch swing, only to find them dead in the pasture once they are finally trying to pay back your investment in care. Wow Geoff that truly is tough. God Bless you for your hard work. Isn’t there any way you can deter the Bob Cats and Coyotes . Like a Shot Gun Maybe. Good Luck and God Bless Hang in there it will get bettter any you will definately figure it out.